hillarchitects_ > THINKING OF DEVELOPING? Are you thinking of developing a property? After all, other people have done it – sometimes it seems to be the national sport. Perhaps you own a property that you think may be able to support a larger development; perhaps you have your eyes on a potential site. can I develop this site? what can I make out of it? If you are a total beginner you will need advice from a number of professionals, but the very first steps are pretty straightforward, and begin with the site. 1. Is my site suitable? To understand what controls relate to your site you can get a planning certificate from your local council (costs under $100), or you can simply access council’s Local Environment Plan (LEP) controls from their website and work things out yourself. At this stage the most relevant controls are land use (Zoning) and Floor Space Ratio (FSR). The Zoning control will tell you what type of building you are permitted to build, whether it is a single family house, attached dwellings like townhouses, or higher densities such as apartment buildings or mixed use developments. Refer to the colour coded maps for your area – if your site has an R1, R2, R3 or R4 zoning you may well be able to build more on it than just a single residence. If your site is in or near a commercial area it may have a B1, B2, B3 or B4 zoning which could allow for mixed-use development such as shops on the ground level with apartments above. If the zoning allows it you still need to know how much you can build. 2. What controls will I have to comply with? The Floor Space Ratio controls the size of the building; it is shown as a ratio between the maximum floor area allowed and the site area (shown as 1). For example, an FSR of 2:1 on a site 600 square metres in area will allow maximum gross floor area of two times the site area, or 1,200 square metres. Note that the floor area figure does not include everything you may have to build, such as balconies and basement car-parking. 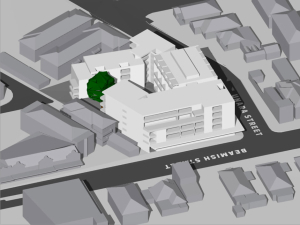 In a site zoning that permits apartments that floor area could provide about 14 2-bedroom apartments, or as many as 20 one-bedroom apartments, with a suitable area for circulation. Council will be reluctant to approve a building providing only one type of dwelling, so you might be looking at a mix of unit types with, for example, 10 2-bedroom apartments and 6 one-bedroom apartments. There are other controls that may limit what you can build on your site. Controls concerning height, setbacks from the street and side and rear boundaries may be imposed by council’s LEP or Development Control Plan (DCP), or a State Environmental Planning Policy from the state government (e.g. SEPP65). To ensure that your site can realise its development potential within the constraints of the full suite of development controls you will need to engage a good architect, as well as a town planner. At this preliminary stage FSR is a reasonable guide to the overall size of the building that will be allowed by council. Now you have an idea of what you can build on your site, and how much you should be allowed to build. 3. What are the likely costs of the project? There are plenty of costs that go into developing a site before you can look to make a return when people move into the finished building. construction cost – by far the biggest figure. You can get an initial idea of construction costs from simple cost-calculators such as this or this, but you should be careful with these calculators. You will need to include costs for elements not included in the FSR calculation such as balconies, roof terraces, basement parking, landscaping and so on. Other variables that affect pricing are site conditions – such as location, slope and ease of access – the type of construction and the quality of the materials and finishes. As nothing has yet been designed there may be a fair amount of guess work involved concerning these extras. Firmer costs can be determined by a quantity surveyor or building estimator after your architect has prepared an initial concept design that examines a few options of what you can get on your site, what we call a design feasibility study. Now that you have an idea of what you can get onto the site, and a preliminary idea of costs, you will want to know if it is going to be worth doing. 4. Will I make any money out of all this? Sorry, but there is no simple answer to this question. The viability of every project depends on many variables, including the site, your financial situation, the state of the housing market affecting potential returns as well as labour and material costs. It is beyond the scope of this short introduction to fully educate you on the development process – there are plenty of courses available (see here, here or here) – but to drill down to whether this project is right for you, now, you are going to need advice on building costing, project financing and real estate. And before these advisors can do their work you will need to know what you are looking to sell so you can determine likely costs and potential returns: financial feasibilities rely on design feasibility studies. If the feasibilities suggest you might not be able to afford to build the project yourself, you could consider alternatives such as joining with someone that can build it (or even partially finance it), or preparing the design and development application and selling the site with an approved DA to someone prepared to pay more for a site ready to develop. 5. So where to now? If you are thinking the process might be something worth pursuing you will need an architect that understands these sorts of projects. We can investigate, advise and document the potential of your site, as well as make the enquiries and negotiate with the relevant authorities; no other specialist will provide all these services. To get your project started a good architect can establish what may be possible: financial feasibilities rely on design feasibilities. We would be happy to help you. We specialise in residential projects, from secondary dwellings and townhouses to multi-storey developments. We’re happy to spend time with our clients explaining the process. As the need arises we can put you in touch with the experts and consultants that may be required to help you along the way. can I be a property developer?